Nienke is a seismologist who works on imaging the Earth's interior based on the vibrations emitted as a result of earthquakes. 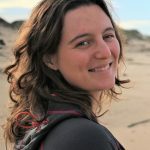 She is a postdoctoral research associate at the University of Cambridge and works on seismic waveform tomography, with a specific interest in developing methods to image density. She enjoys reading a good book, hiking, cycling, and cooking. As ECS rep, she works towards outreach to the community and beyond, and integration and communication between disciplines. In this light, she collaborates with the TS and GD divisions to set up a series of short courses on the "Solid Earth 101", aimed at early career students and with a specific focus on integration between disciplines. This builds upon the EGU short course "Seismology for non-seismologists", which she's already helped organise for the past couple of years. 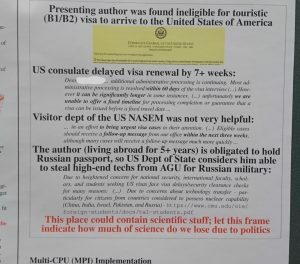 The AGU Fall Meeting: that other large geosciences meeting in the world. As every year, thousands of people burned their yearly share of carbon flying across the globe. Just like last year, the meeting was held on the East coast – but instead of balmy New Orleans, we found ourselves in somewhat chilly Washington DC. For those coming from Europe, this meant slightly less travel (as well as a slightly less gruesome jetlag) – for those coming from (East) Asia, it was probably the other way around. And although DC is not as vast a US city as AGU’s traditional spot San Francisco (DC’s generally low architecture and building style having an oddly un-American and Old Worldy feel), the conference centre itself was spacious and well equipped for the 25 000 people it would host for the week of 10-14 December. For oral sessions, Seismology found itself mostly in the adjacent Marriott Marquis hotel, while one enormous poster hall down the basement of the conference centre (spanning multiple blocks) connected all of the geosciences, grouped together in themes ranging from the “Earth’s Interior” to “Beyond Earth”. Interestingly, seismology finds itself in every of these themes – especially with the recent addition of the lone seismometer of the Mars InSight mission. The conference resulted in some decent workout for even the most avid armchair scholars, as we sped back and forth between the talks and posters. It is impossible to adequately summarise a five-day conference – but here are some highlights according to our envoyées Lucile, Marina and Nienke. 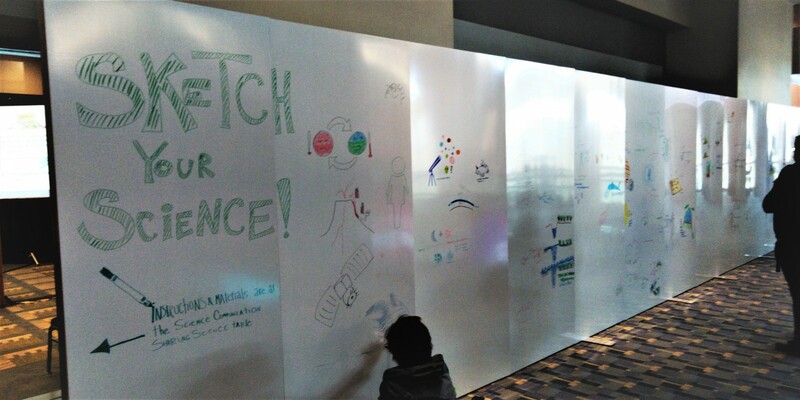 “During AGU 2018 I had the opportunity to help the AGU ‘Sharing Science’ Program from backstage. Bridging the gap between science and society is not an easy attempt and the mission of the AGU ‘Sharing Science’ is indeed to increase knowledge on how to effectively communicate the goals and the results of research projects to broader audiences, including journalists, educators, students, policy makers, general public. 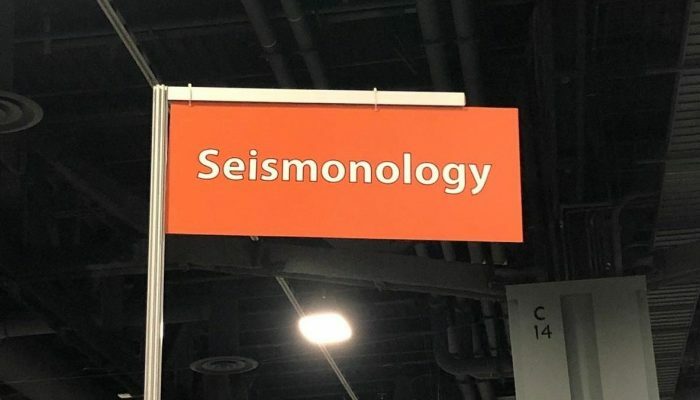 …the renaming of our research field as “Seismonology” on the first day in the poster hall – quickly removed but captured by early-bird scientists. 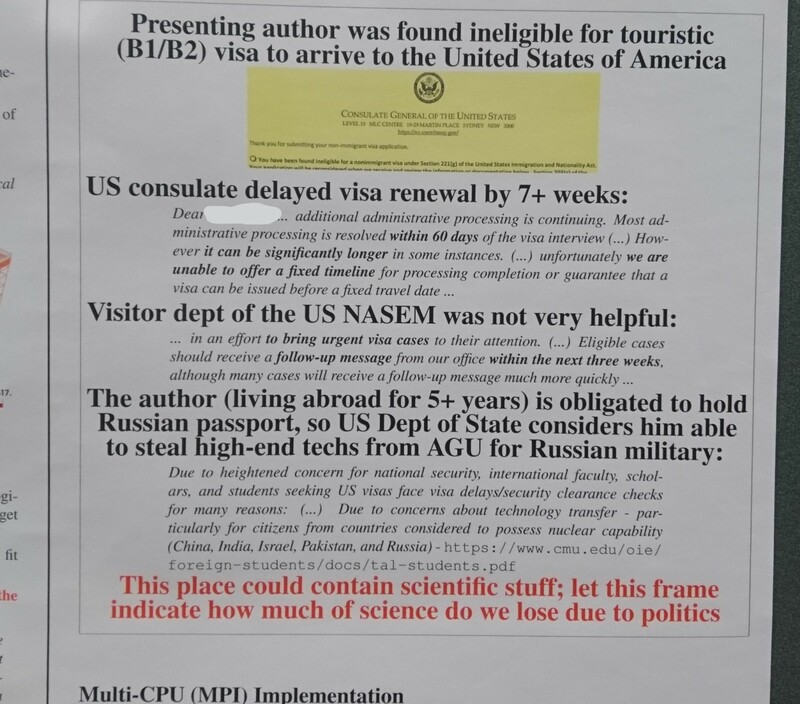 …the footprint of global politics in the programme, with many sessions showing withdrawn abstracts or missing presenters due to denied visas. …and equally political, spotted on a British poster: a prominent EU flag next to the ERC logo. Two magnitude 6.9 earthquakes in Indonesia in the space of two weeks, 20 km apart. Meanwhile, a magnitude 8.2 event in the Pacific. Did you get any questions about the end of the world being upon us, how come all these quakes happen so close together and why the Fiji event was so harmless? 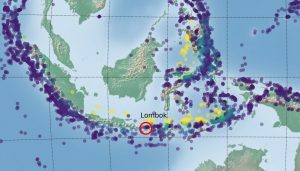 The quakes in and around the island of Lombok, Indonesia, fall within a larger series of events. Apart from the two Mw 6.9 quakes on 5 and 19 August, there was a whole set of Mw 5+ and Mw 6+ in the surrounding days, not to mention the hundreds of smaller fore- and aftershocks (see Figure 1). 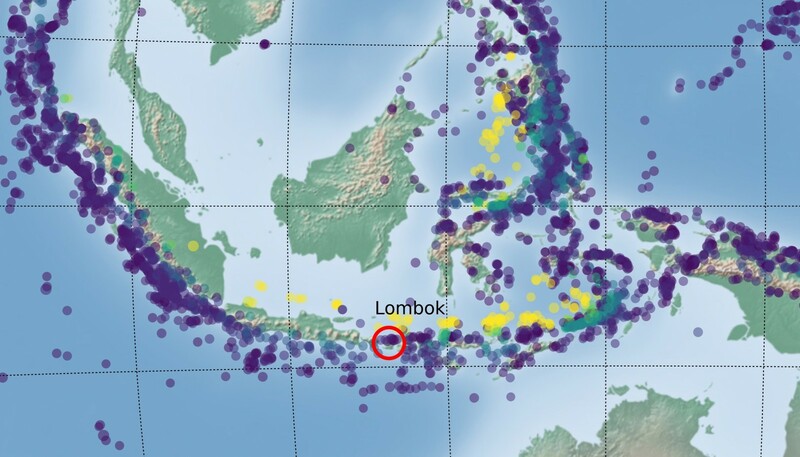 This huge seismic activity around Lombok is hardly surprising: Indonesia lies on the Pacific Ring of Fire, where the Australian oceanic crust subducts beneath the Eurasian plate along the Sunda Arc with a convergence rate of about 7 cm/yr [Nugroho et al, Tectonophysics 2009], consequently generating a lot of seismic and volcanic activity. To the east, subduction has progressed further, such that the Australian continent is now in collision with the Indonesian islands. The recent quakes are, however, not direct subduction earthquakes – the main subduction zone lies south of the islands and at the location of these earthquakes (between 20km and 30km), the subducted Australian plate sits much deeper. The location and focal mechanism therefore point to a shallow south-dipping thrust fault that is part of the Flores Back-arc Thrust system [1, 2]. The series of earthquakes started with a Mw 6.4 event on 29 July, that killed around 20 people and injured hundreds . About a hundred aftershocks followed, and roughly a week later, on 5 August, an even larger Mw 6.9 event shook the area again, thereby degrading the 29 July event to a foreshock. The Mw 6.9 event was much more destructive with a death toll of more than 450 and counting, not to mention the hundreds of thousands of people who lost their homes, properties and got displaced . A tsunami warning was issued for a while, but was retracted when it became clear no dangerous waves were excited – otherwise the damage might have been even more widespread. Then, two weeks later and just 20 km to the west, another M 6.9 earthquake hit the island on 19 August . Although of the same magnitude as the 5 August event, the 19 August earthquake resulted in far fewer casualties (around ten reported so far ) – presumably because of the destruction and evacuation come after the first earthquake. As anyone living in an earthquake-prone region will tell you, it is common for a whole series of quakes to strike the same area within a short time: the release of stress on one part of a plate contact or system of faults causes another part to become instable, and some argue that this can even happen over very large distances [Stein & Toda, Science 2012]. That’s the reason why, so shortly after this series of destructive events, people on the Lombok island continue to remain on alert, with many preferring to sleep under shelters – even if their homes are still intact. So what about the M 8.2 event near the Fiji islands? It also happened on 19 August, was more than 30 times as strong, but barely made it to the news. The 19 August event is a typical deep-focus earthquake and falls within the Tonga subduction zone. At the Tonga Trench, part of the Pacific Ring of Fire, the Pacific plate subducts steeply beneath the Australian plate. The normal faulting focal mechanism, location and depth indicate deformation within the subducted slab (Figure 3). 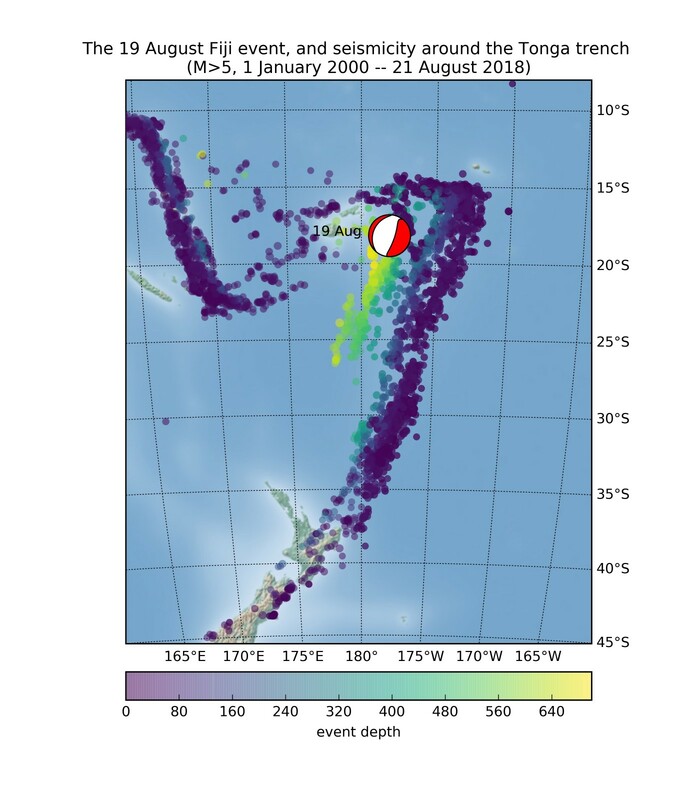 Figure 3: The recent M8.2 earthquake in the Tonga trench region. Background seismicity is all events of magnitudes M>5 as reported by the USGS NEIC catalog. Both strong events and deep events occur quite regularly along this trench, but what makes the 19 August earthquake quite unique is the fact that it is both strong and deep. 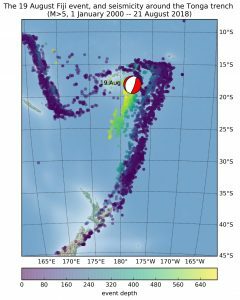 However, the USGS has received very few “Did you feel it” reports*: fortunately for the people living on the Pacific islands, its depth of 560 km meant that any devastating surface waves were hardly excited at the surface and damage seems limited so far . On Lombok, on the contrary, the matter cannot be addressed lightly. Efforts have started to clean the rubble and rebuilding houses, schools and hospitals. But this proves to be hard: most of the infrastructure, especially in the north of the island, has been gravely damaged by the earthquakes themselves, or ensuing landslides. Many people are living in temporary shelters, and it is difficult to supply food, clean water, and medicines to the area. No, the Lombok and Fiji events are not likely to be related, in case someone asks you (although I’m probably preaching to the choir). There are roughly 7000 km between the islands and the only thing they share is a contact with the Australasian plate. [*]: The largest ever recorded deep-focus event was the Mw 8.3 Sea of Okhotsk earthquake, which occurred off the Kamchatka Peninsula on May 24th, 2013 at 600 km depth. This earthquake attracted special attention because, among other issues, it was felt all over Asia [Chebrova et al, J Volc. Seismol. 2015] , despite the large epicentral distance. Note: data were downloaded from the IRIS and NEIC catalogs using obspyDMT [Hosseini and Sigloch, Solid Earth, 2017] figures were produced using matplotlib based on obspyDMT scripts. Welcome to the blog of the Seismology (SM) Division of the European Geosciences Union (EGU). This blog serves as a platform for the seismology community to share news, events, and activities, as well as updates on the latest research. It is especially dedicated to the EGU young seismologists. The blog is run by the ECS-rep team (Early Career Scientist representatives) of the EGU Seismology Division. If you want to be write a post for this blog, please get in touch with the team (contributions from guest writers are always welcomed). 2019 General Assembly is getting closer!